You will be given a reference e-book to read which has 364 pages And the test will be based on that e-book , you can take final test within 1 year of purchase. Grant writing involves the act of completing grant application processes in order to receive funds usually provided by renowned institutions including a corporation, foundation, trust or government department. The application processes that a professional grant writer needs to complete are called grant submissions or grant proposals. Being a certified grant writer requires you to take up a grant writing course so you will have an easier time fully understanding the concepts behind grantsmanship. This will make it easier for you to use all the principles behind grant writing and apply such principles in providing your services to those who need them for a fee. Grant writing requires you to become aware of your target and make sure that you write contents with appropriate languages.? If you want to become successful in grant writing, then you have to make sure that you gain a complete understanding on the procedures involved in grant application. You are also required to have superior grammar and writing skills while also having the ability to complete all your tasks independently and stick to your deadlines. Grant writing is also a perfect job for you if you are keen to details and you are capable of understanding matters linked to financing and budget. You should also be willing to spend a lot of time sitting in front of your computer to do some researching and emailing tasks. Excellent communications skills are also needed as there are times when you have to visit the grantors and your clients. Being a certified grant writer requires you to complete a grant writing certification program from a reputable and reliable company and you can get it through Brainmeasures. The ISO certification received by this renowned online certification and testing company gives you a hundred percent assurance that all the certifications programs that it offers especially the grant writing certification program can help hone all the skills that you need to become successful and effective as a grant writer. With the help of the grant writing certification program from Brainmeasures, you will become more familiar about the essentials of researching, writing, maintaining and acquiring grants. You will also learn the basics of formatting your proposals, effective writing and the steps involved in getting funding. To complete the program, Brainmeasures will require you to pass the grant writing test and successfully overcoming this challenge is a major help in getting your certificate. 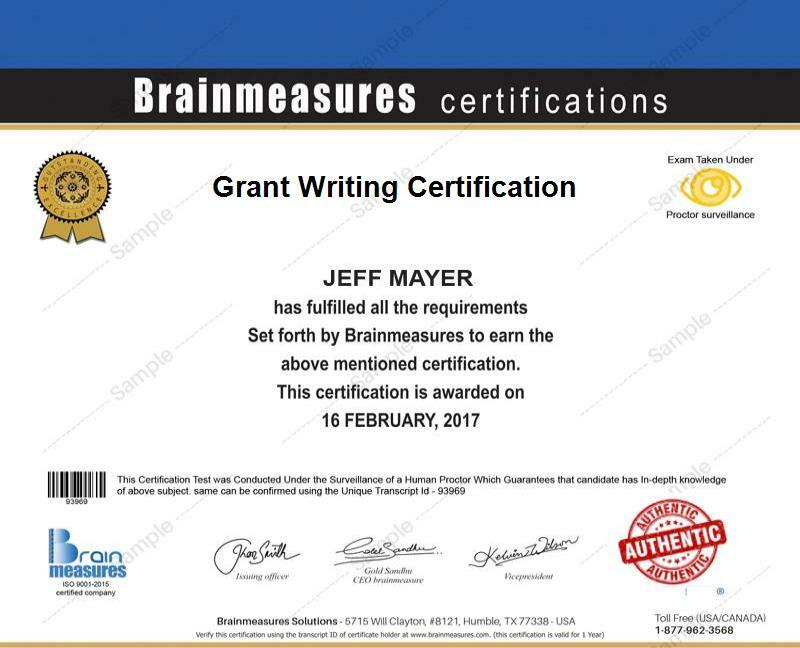 Brainmeasures offers its grant writing certification program to anyone who is interested without setting any requirements or qualifications so rest assured that you can easily take part in it. The program is extremely beneficial to those who are still new in the process of grant writing and requires a basic understanding about it, those who are already part of grant writing projects but are dealing with issues and problems regarding how to make such projects successful and successful practitioners in grant writing who are currently in search of more advanced insights and specialized information related to the field. If you complete your grant writing certification course, then you can expect to earn a decent sum of income. You can actually earn in three ways. The first one is on a per-hour basis and the average hourly rate that you can expect to receive is around $50-$70. The second one is on a per project basis and you can expect to receive fees of around $1,000-$8,000 per project depending on its complexity and length. The third way to earn money as a grant writing certification holder is through commission. This will allow you to receive a payment which is based on an agreed percentage of the requested funding. Competent grant writers who are paid by commission can expect to receive around one to five percent of the total awarded grant.